Spectre Performance offers a trio of 50-state street legal air intake system upgrades for 2004 and 2005 Chevrolet Silverado 2500 / 3500 HD pickups and its counterpart the GMC Sierra 2500 / 3500 HD equipped with the 6.6-liter Duramax Diesel LLY code engine. The street legal Spectre Performance 2004 and 2005 Chevy and GMC Duramax Diesel intake systems are available with three air filter colors. Air intake number 9980 features a red-media air filter, 9980B includes a blue-media air filter, and 9980K uses a completely black air filter. Color choices for these Duramax air intake systems come in the form of Spectre High Performance Racing (HPR) universal cone air filters. The diesel HPR air filters used in these kits are specifically designed for the airflow and filtration needs of a turbo diesel engine. These air filters can be serviced when dirty, using part number 884820, and used again. Spectre Performance warrants all its products to be free from workmanship and material defects with a limited 90 day warranty. 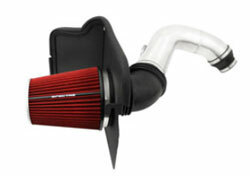 However, Spectre Performance Air Intake Systems are designed to perform reliably for years to come. All three Spectre Performance air intake system part numbers for the 2004-2005 Duramax Diesel are designed to add street legal gains in horsepower and torque without compromising engine protection from harmful debris. 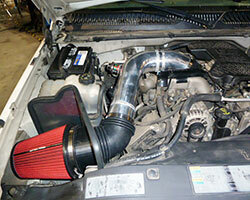 These air intake systems use a high quality polished aluminum intake tube to direct air into the engine. They also include an application specific air filter heat shield, finished in a textured black powder coat, to help reduce the amount of hot air entering the air filter. These intakes include all necessary components and can be installed using basic hand tools for a true bolt on street legal performance upgrade. 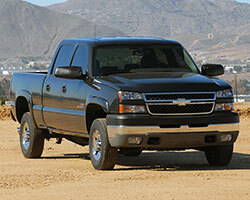 General Motors made a mid-year engine change in 2004; as a result this air intake system only fits 2004-2005 Duramax Diesel engines with the LLY engine code. Please check your engine code before purchasing. If assistance is required please feel free to call Spectre Performance at 909-673-9800. Since 1983 Spectre Performance has designed and offered unique, innovative, parts and components to fuel your car or truck obsession. Whether your fixation happens to be a classic muscle car or a modern diesel burning heavy-duty pickup, Spectre will help fuel the passion for performance burning within.